Gloster Meteor F I "Trent"
In March 7th 1945 a Gloster Meteor F I (EE227) was sent to the Rolls-Royce Plant at Hucknall for installation of two R.B.50 "Trent" turboprop engines. EE227 was selected because it was already fitted with an enlarged wing spar so the new engines could be fitted with out to many problems. The RB-50 "Trent" engine was a Rolls-Royce Derwent turbojet engine fitted with a forward drive shaft, a reduction gearbox and a Rotol five-bladed propeller of a diameter of 7' 11''. 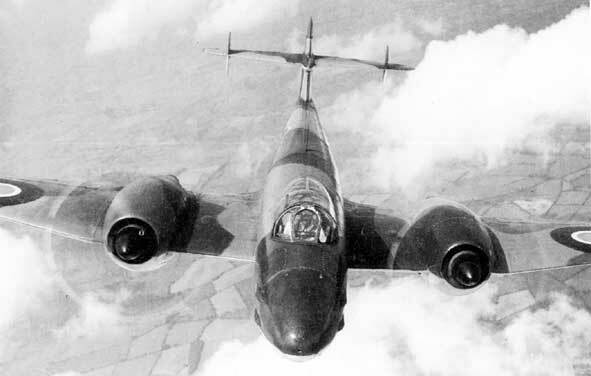 Six month later on the 20/10/1945 at the airfield at Church Broughton the Gloster "Trent" took to the air for the first time with Eric Greenwood at the controls, making the first flight of a turboprop powered aircraft in the world. A number of problems were found with the prop wash and directional instability,the "Trent was returned to Hucknall were these were fixed and the aircraft was flying again by March 1946, later smaller Rotol propellers were fitted. In April 1948 the "Trent" Meteor was transferred to the Navy for testing, as they were interested in the use of turboprop aircraft for deck-operations. On the 22/9/1948 the aircraft was returned to Rolls-Royce, were it was restored to it's original condition, then being returned to RAF Farborough were it was scrapped in June 1949.